The CMT Clay Target Club has been operating for well over 50 years, an initiative founded by locals. The well attended first meeting was held on the 8th of October 1953 in the town hall to discuss the formation of the club. Mr EH Harris proposed the club to be named the "Cunderdin and Districts Gun Club". After considerable discussion, a subscription fee was decided: 42 Shillings with a nomination fee of 21 Shillings. The club was born. Initially the club was located east of Cunderdin near the parkbay just out of town, in what is now Jaspers paddock. By the 6th AGM in March 1958, land was purchased at a cost of 90 pounds and the club moved to it's current location adjacent the Aerodrome with the Airfield Post Office Building for use as the Club House. 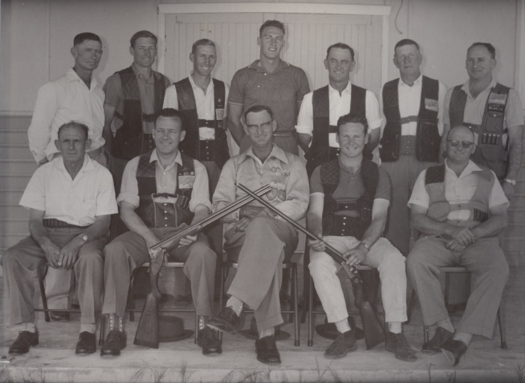 About 30 years ago the club undertook massive upgrading of the shooting facilites, being the first place in Western Australia to be able to shoot Olympic Discipline (ISSF) Trap. Over the years, members have been able to accomplish high achievements due to the fantastic facility which we have at our doorstep. John Harris, Laurie Solomon, Pat Dennis, Harold Lundy.